Tavistock is an historic market town located in a pleasant valley astride the fast flowing River Tavy, 12 miles (19.31 km) north of Plymouth. 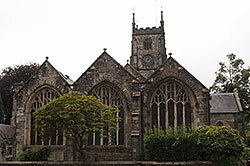 The town grew up around Tavistock Abbey which was founded back in 961 AD. It has a long and distinguished history and was one of four stannary towns where tin was weighed and stamped and monthly courts held to regulate tin mining in the area. Around 1540, Sir Francis Drake was born on a farm just south of Tavistock. The statue to Drake that stands on Plymouth Hoe is said to be a copy of the statue found in Tavistock at a roundabout on the Plymouth road. Down the years, in addition to Farming, the Tavistock area was known first for tin mining then textiles and finally in the 19th Century for copper mining. 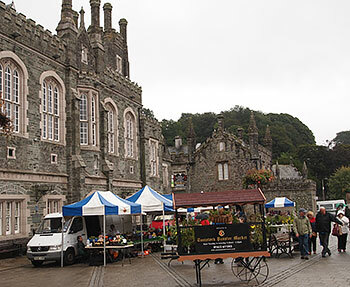 Today, Tavistock remains a busy market town. Back in 1105 the local monks were permitted to hold a weekly Pannier market and a modern version is still held in its own large building behind the town hall. In 1116 AD a three day fair was given the royal seal of approval. This survives as the October "Goosey fair" at which originally the local peasants would buy a fine goose with plenty of time to fatten it for Christmas. Nowadays, there may not be many geese for sale but the fair continues in modern guise and draws thousands of merry makers from near and far. In addition to the shops and market there are numerous hotels and guest houses welcoming tourists to the town, which is a good starting point for exploring Dartmoor. The Parish Church is named after a Roman centurion who became a Christian. It was dedicated in 1318 but rebuilt between 1350 and 1450 in the Perpendicular style. At that time, due to the growth of the local textile industry, a Clothworkers' Aisle was added. The tall tower is built on four arches, one of which was said to be for the local tin miners. There are fine stained glass windows including one by William Morris. The remains of the old Benedictine abbey can be traced in and around the buildings nearby. From this pleasant park you can follow a wooded walk beside the old Tavistock canal to the area of Crowndale Farm where Sir Francis Drake was born. The present farm buildings, however, do not date from Drake's day. This historic wharf is just a short 4 mile (8.4 km) drive from Tavistock. It occupies a picturesque setting beside the River Tamar and marks the upper limit to which sailing vessels could navigate. Morwellhan acted as Tavistock's port from its earliest days but its importance greatly increased in 1817 when the Tavistock Canal was dug to carry copper ore to the quayside. The quay's industrial days are long gone and today there is a visitor centre, a working Victorian farm and a nature reserve. The BBC television series Edwardian Farm was recently filmed here. There is also a miniature mine railway that will take you along the river bank and underground into the old George & Charlotte copper mine.